Recently we built a custom modular T-Cape for one of our customers. The plan is the Wiltshire, which is also available as a one-story with a lower pitched roof. Our website elevation of our custom modular Wiltshire T-Cape. Our website floor plan of our custom modular Wiltshire T-Cape. 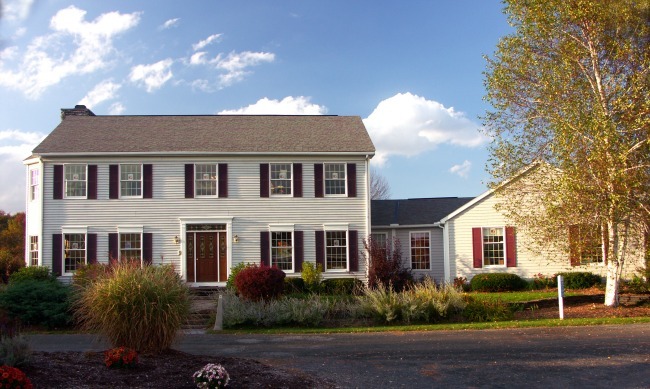 The standard modular Wiltshire T-Cape has 1,900 square feet, three bedrooms, and two baths on the first floor. Click here to see several photos of our custom modular Wiltshire T-Cape. As the photos show, the three front facing gables along with the center A-dormer add character and charm to the exterior of the home. The entry porch is practical yet ornamental. The floor plan is set up for easy entertaining. The kitchen, which opens to a large dining room and gorgeous living room, features a gourmet chef’s granite center island along with plentiful cabinets. The distinctive hardwood floors and Italian tile add beauty throughout the home. The master bedroom suite is well-equipped with dual lavatories, an oversized shower, and a generous walk in closet. The other two bedrooms are comfortably sized, while the laundry room provides ample and attractive cabinetry. The unfinished second floor offers abundant additional room for future expansion, such as for another bedroom or two, a home office, playroom, or storage. For more information about modular home plans, see Designing a Modular Home in my book The Modular Home. 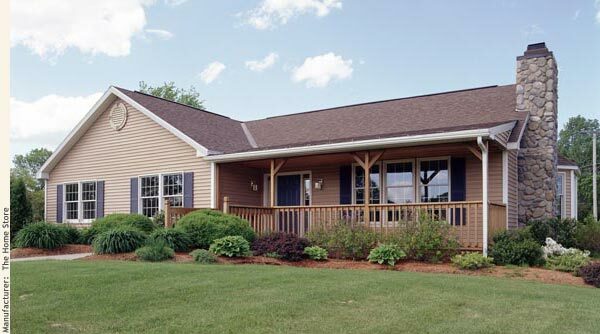 There are a variety of ways to compare the advantages of a one-story vs two-story modular home. In part your choice will depend on your personal taste as well as your local real estate market. But you will likely also consider the distinct advantages of each. Here’s a list of the advantages most often mentioned by my customers. The Home Store’s Sugarloaf 5 one-story T-Ranch at it’s model home center. Easier – and cheaper – to heat and cool. The Home Store’s Whately 1 two-story at it’s model home center. For more information about the benefits of building a one-story vs two-story home, see Designing a Modular Home, Modular Home Specifications and Features, and Finding and Preparing a Building Lot for a Modular Home in my book The Modular Home. There are many things to learn the first time you build a modular home. But if you’re like most homebuyers, you won’t get the full benefit of what you learn, since you’ll likely only build one home. But you can benefit from what I’ve learned over twenty-eight years building more than 1,200 homes. To start with you can read my book, The Modular Home, which gathers all this information in one place. Use these modular home checklists to guide you through the process of building a modular home. Of course, it’s hard to use a book efficiently the first time you use the information. That’s why I’ve created several checklists that cover the most important steps. 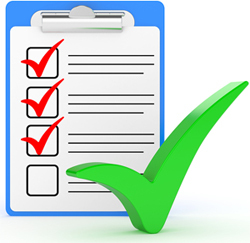 Below is a link to each of the checklists. There’s also a link to this list on the home page of The Home Store’s website. I hope you find these modular home checklists helpful. For more information about all the topics covered in the checklists, see my book The Modular Home. I’m a member of the baby boom generation. Like most people in this demographic, I’m not as nimble as I once was. Even so, I get around well “for my age”, although I do have the help of a new left hip. I exercise regularly and don’t need the assistance of a cane, walker, or wheelchair. I’m proud to say that I can still climb stairs as fast as most 30 year olds. But this won’t always be so, and it’s important that I recognize that, especially when my wife and I build our next home. 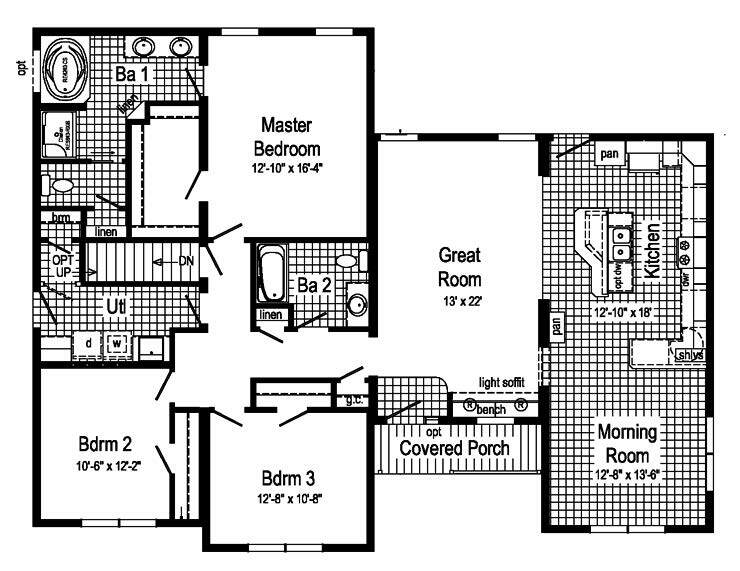 Our T-Ranch model home built to Universal Design specifications. This is one of our most popular homes. In my experience as a modular home builder, however, many people underestimate the inevitable effects of aging when they design their home. It’s not because they fail to think about it. Nor because we fail to bring it up when discussing their selections. In fact, our T-Ranch model home displays several Universal Design features that should be considered by anyone who wants their home to be user friendly as they age. But most people have a budget and when forced to make a choice between a feature that will benefit them in the distant future or an amenity they really want now . . . . Well you know how that goes. Adding a bridge can create a level entry without having to build a ramp. The moat keeps the dirt away from the front of the house and allows the water to drain away. The most vivid example for me occurred not long after we built our T-Ranch model home. Two sisters in their 70’s decided to build a custom one-story that contained many of the Universal Design options in our model. However, they didn’t choose to eliminate the stairs to their front or back door. They said they were in good health and able to get around on their own. I pointed out that it was easier to create a level entrance without ramps if we did this while building their home. This is always true, but it’s particularly true on a property that’s very sloped, which was true of their lot. The stumbling block was the extra fill required to build a “bridge” to one of her exterior doors. There were two reasons they decided against this. One was because the fill would cost a few thousand dollars, which they could only afford by giving up the hardwood floor in the dining room and living room. In addition, they didn’t like how the property would look with the extra fill. Sadly, one of the sisters had a serious stroke two years after they moved into their home. Although she survived, she could no longer move about without a wheelchair. Since there was no level entrance, the sisters had a ramp built to their back door. It was quite sizeable – and by their own admission unattractive – because the door was five feet above the finished grade. But it was the only practical choice at that point. When I tell this story, most people are surprised the sisters made the choice they did. But I’ve found that many people make these kinds of choices because of how strongly they want their dream home to include all of their desired amenities. Ultimately it’s your choice what you build. But give serious thought to building a home that meets your family’s needs now and into the future. Design it so it allows you to age in place without forcing you to make expensive renovations, move, or radically alter your lifestyle when your abilities start to slip. It’s certainly something my wife and I will do. For more information about selecting specifications that will meet your family’s needs now and in the future, see Modular Home Specifications and Features in my book The Modular Home. Last week I pointed out that the marketing literature for most house plans displays a dressed-up exterior elevation. This is significant because the ornate features shown are not usually included in the standard base price for the plans. Many a customer has assumed they were getting everything they saw in the literature drawing, only to find out when the house was built that they were getting a simpler, less adorned version. I suggested last week that there are two ways to make sure you are getting what you want. The first is to look closely at the specifications listed in the modular builder’s estimate, and the second is to have the builder provide you with a drawing of the exterior elevation showing exactly what you’re getting. There are three levels of detail that must be included if you are to get an exact drawing of what your finished home will look like: the manufacturer must draw what you are ordering, not a generic drawing; the dealer or general contractor must add the site-built structures; and someone must map both of these onto the slopes and contours of your property. I’ll discuss the first two requirements today and the third in my next post. 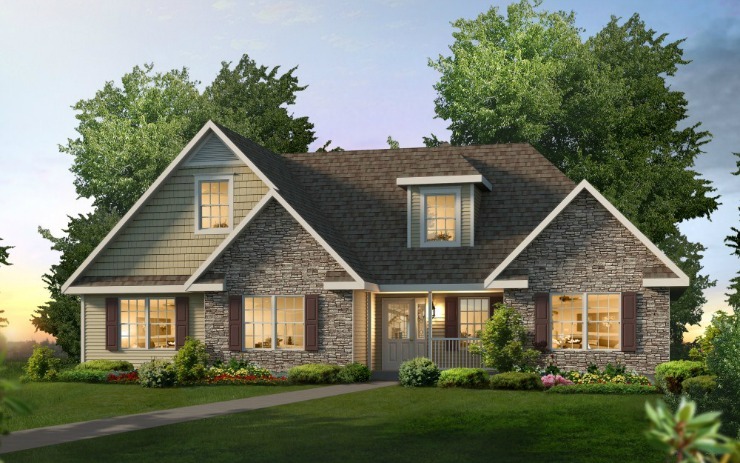 The marketing literature for this T-Ranch plan shows the following options: a 12/12 cape roof, one A-Dormer with a hip roof, a reverse gable, gable returns, vinyl clapboard and scalloped siding, cultured stone siding, a front porch, an upgrade front door, and window moldings around the attic window. Your modular dealer and general contractor needs to include whichever options you select in their exterior elevation drawings, since these show what you will get. All modular manufacturers will provide an elevation plan of your home, but not all of them will draw the exact home you are building. They may instead give you a generic plan showing the home without any of the custom touches you’ve added. For example, they may not show the additional windows and sidelights at the front door you selected, and they may leave out the reverse gable you specified for the roof above your front door. You should not settle for a generic elevation. Ask your modular dealer to provide you with an elevation plan of what you have ordered from the manufacturer before you authorize him to build it. If his manufacturer will not provide the plan and he is unable to create it himself, ask him to have it drawn by someone else. Even if you have to pay extra for an accurate plan, you need to see it. Little things like the spacing of the windows can matter a lot, especially when you have taken a standard plan and lengthen the plan, added windows, or simply moved some windows within a room to accommodate furniture. In addition, if you are dressing up a plan’s no-frills standard look, you will want to see if your vision holds up to your own scrutiny. 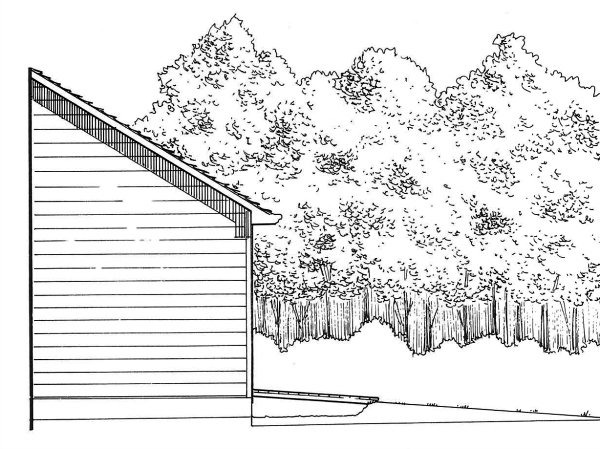 Asking the dealer to provide plan-specific elevation drawings will not be sufficient when you are having additional structures such as a garage, deck, or porch built on site. Unless your elevation plans include all site-built structures, you will not be able to review what your home will look like. However, you might not get the needed assistance from your dealer if he is not serving as your GC. Your dealer may feel that since he is not completing the GC work, he does not know what the GC is planning to do. He may point out that the regulations governing modular construction in your state do not allow the manufacturer to include any of these site-built structures in its permit plans. He may correctly insist that state and local officials only allow the manufacturer to draw what it is building. While this is true, some dealers and manufacturers will help you by creating a separate set of plans that show the GC’s work. Before completing the drawings, they will ask you and your GC to provide the details, insist that you take responsibility for their accuracy, and charge you an additional fee for the assistance. You should make this investment. An alternative to having the dealer complete the elevation plans is to ask your GC to complete his own set of plans. The advantage to this approach is that he will know exactly what he is building. The disadvantage is that you will now have two sets of incomplete plans, one of your modular home and one of your GC-built structures. The only way they will appear on the same page is if the GC recreates the modular plans or another person integrates the details into a third set of plans, an impractical and wasteful step. This is why it is better to pay the dealer to provide a complete set of plans. Remember, you need your modular dealer and general contractor to include whichever options you select in their exterior elevation drawings, since these, not their marketing literature, show what you will get.